Last Tuesday afternoon Chamber staff hosted a small barbecue for the Chamber Board of Directors and the chairs for Chamber committees. The barbecue was a way for us to thank them for their service to the Chamber. It also allowed us to show off our new patio setup! The new grill and patio furniture were generously donated by Chamber member Eloi. Eloi is a marketing/branding company. If you have a need for branded marketing materials to promote your business, Eloi can help you create the perfect solution. They also generously provide some amazing pens that are a big favorite around the Chamber offices. If you would like to host your own event in our conference room and patio, contact Amanda Jamison in the Chamber office for more details. 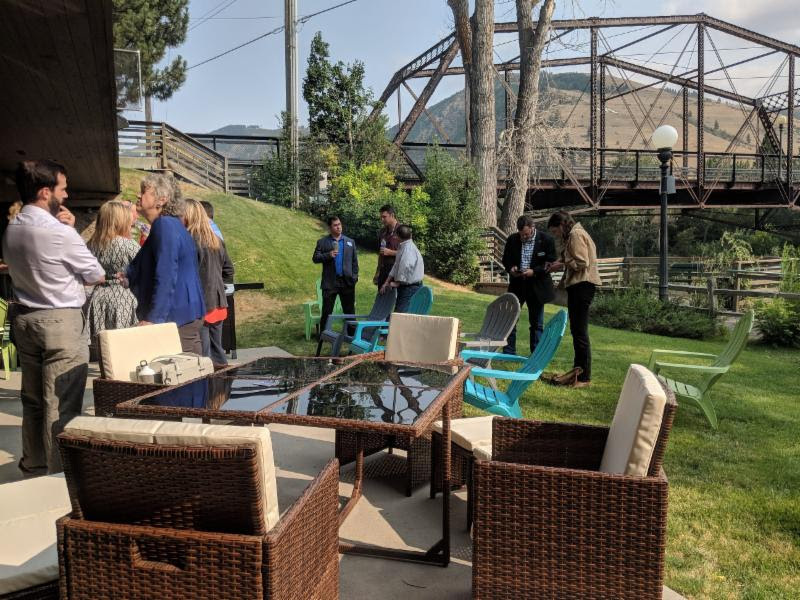 It is an excellent location (overlooking the river and Van Buren Foot Bridge) to host a reception, offsite meeting or strategy session. You'll get use of the conference room smart board as well as the grill and patio furniture.